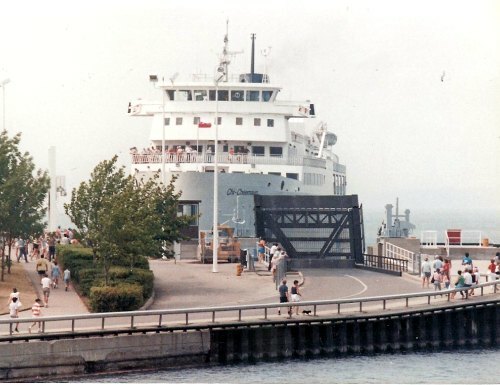 There is a long history of the Tobermory ferry sailing the waters of Georgian Bay between the tip of the Bruce to Manitoulin Island. The MS Chi-Cheemaun runs the route between Tobermory and South Baymouth joining the disconnected portion of HWY 6. Boats have been ferrying cars across the Georgian Bay waters since the 1930's. The Kagawong was a wooden vessel that most modern passengers would be nervous to ride along with their cars. There have been a few predecessor ships like the MS Norgoma and the SS Norisle that made the trip between the largest fresh water island in the world and Tobermory. I traveled on the Norgoma back in the 60's when Tobermory was more a sleepy cottage town. But the Chi-Cheemaun has been the main ferry now since 1974. The SS Nindawayma had a short run as the sister ship to the SS Chi-cheemaun from 1989 to 1992. If you have never experienced a ride on a ferry the size of the Chi-Cheemaun it is awe inspiring. Able to carry full size transport trucks and buses it is more that just a luxury yacht. The ride between the two ports will run about 1 3/4 hrs. In peak season you can catch one of four rides between the two harbours whereas in May and October the ferry frequency is cut down to two crossings per day. In peak season from mid June - Sept the Chi-Cheemaun departs Tobermory at 7am whereas the non-peak months the ferry departs at 8:50. Whether you are taking the round trip just to ride the MC Chi-Cheemaun or want to take in Manitoulin Islands rich Ojibway history or the over 100 inland lakes the big canoe is a ride to experience. Return HOME from riding the Tobermory Ferry.